It’s an Instagram world, and selfies have skyrocketed in popularity in the last few years. Not surprisingly, the resurgence of instant print cameras has likewise led to the popularity of self-shot hard copies. Instead of just uploading to Instagram or sharing digital copies with friends, consumers can now exchange physical photos in a snap. As with digital photography, of course, there’s an art and a science to taking the perfect selfie. The right angle can make the difference between a keeper and a throwaway, and plenty of us have spent more than a little time finding it. Fortunately, the Fujifilm instax line makes taking great selfies a snap. Here are a few ways you can improve your angles and leverage the camera’s unique features to get that perfect shot. No front-facing camera? No problem! Digital selfie-takers often rely on their phones’ dual front-and-back lenses to line up their shots, but there are other options. Take a look at your reflection in the front element of the lens of your instant camera. The instax Mini 9’s selfie mirror will help you to find the perfect alignment. Your ideal shooting angle will depend upon how many people are in your shot. If it’s just you, you’ll want to focus the center of the camera on your face, regardless of the angle. With a partner or group, however, you’ll need to stretch out your arm and turn your wrist. Given instax cameras’ small film, the ideal angle is particularly important for fitting everyone in the frame. Selfies not turning out the way you expect? Try holding the camera to your side and turning your head, rather than holding it out in front of you. Depending upon your build, body type and photo background, the turned-head shot might be much more flattering. The perfect angle will only show off your features if it’s combined with great lighting. If you’re facing away from a light source and angling the camera down at yourself, for example, your facial features will appear dim and washed out. Depending upon where you’re taking your selfie, you might be able to adjust the room’s lighting to accommodate your angle. In most cases, however, you’ll want to do the opposite. Find the right angle between your arm, camera and face, and then rotate in place until the room’s lighting is serving you best. 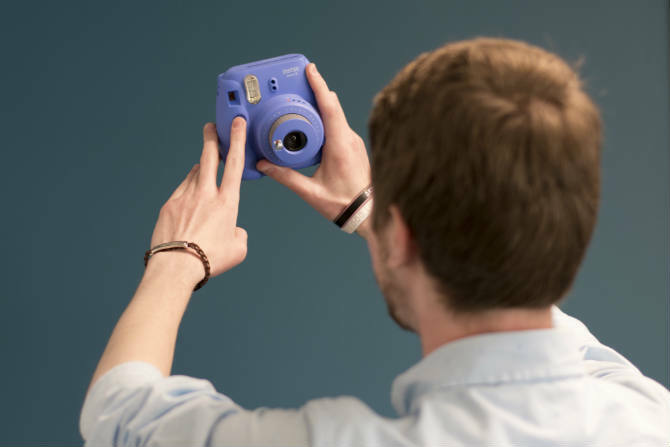 Some models, such as the instax Mini 9, come with their own close-up lenses that reduce the focus distance. It can be quickly snapped into place on the front of the camera, allowing for clearer close-ups than you’d achieve by holding the regular lens closer to your face. If you use the close-up lens, though, remember to remove it before taking longer shots! It clarifies objects up close, but things get blurry at a distance. The instax line includes a variety of modes, some of which are made specifically for taking selfies. For instance, the instax Mini 9’s selfie mode adjusts the brightness and focal distance for selfies, not regular shots. The Mini 90 has a similar “macro” mode, which reduces the focusing distance of the lens to a range of 30-60 cm. Functioning similarly to the Mini 9’s close-up lens, this capability makes everything in that range appear more clearly and in greater contrast to the background—just what you want for a selfie!